I’ve lived in the Auburn Gresham neighborhood on and off for about twenty years. Originally, I moved into the westernmost part while going through a divorce. It is a neighborhood of large courtyard apartment buildings and single-family homes. The shops along West 79th Street and along Ashland Avenue guaranteed I had no need to leave my community for anything. Public transportation is a 24/7 convenience, so not having a car wasn’t a problem. After my son was born, I continued to live in that area. Fortunately I was able to find good, reliable daycare in my area so I could go back to work without worry. We have relatives who live in the area so there were get-togethers throughout the year. We often spent summer days splashing in the water playgrounds of Dawes and O’Halloran Parks. My neighborhood, annexed to Chicago in 1889, is snuggled between the more well-known neighborhoods of Englewood to the north and Chatham to the east. The original settlers of the neighborhood were German and Dutch immigrant farmers who drained the low, swampy area and developed the land, followed by Irish settlers. The neighborhood consisted, as it remains today, of single family bungalows, and two-and three-flat and apartment buildings. The majority of residents back then were Roman Catholic. Today, although many of the Catholic churches have shuttered their doors, St. Sabina, nationally recognized under the leadership of trailblazing senior pastor Reverend Michael Pfleger, remains to shepherd its congregation, though the congregants are predominantly black. In fact, it was one of the first churches to open its doors to the blacks moving into the area. During the latter part of the 1950s, blacks began moving into the neighborhoods surrounding Auburn Gresham. For several years, the Organization of Southwest Communities, formed by local community and church leaders, was successful in helping residents maintain peace and keep property values from declining. But as the area grew more rapidly, crime also increased. The racial violence of the 1960s, culminating in the violence that met Dr. King’s march in nearby Marquette Park, convinced white residents to flee. Since the turbulent sixties, the neighborhood has ebbed and flowed. Although hit hard by white flight and businesses who either left the neighborhood or went bankrupt, Auburn Gresham and its residents have continued to rally. The area has seen a steady economic increase largely due to the creation of mini malls, and new businesses like Aldi and Walmart. This summer, Spike Lee employed residents and utilized several locations filming his latest cinematic effort, the controversially titled Chiraq. After eighteen months in the early 2000s living in New York, my son and I moved back and were lucky to return to Auburn Gresham, this time along the hustle and bustle of 87th Street. Living along a major thoroughfare is very different from living in the middle of the community. It’s certainly noisier with sirens in the background nightly. Traffic is always heavy and people often leave trash in our front yard. Yet the hubbub is what makes this city vibrant. It is this mixture of small businesses like Harold’s Chicken Shack, churches like St. Sabina, schools like Joplin Elementary and block clubs like the one on 80th and Aberdeen that make this neighborhood the living, breathing, thriving, locality that it is. Noisy, chaotic, hectic, messy, friendly, sociable, caring—everything a big city community should be, Auburn Gresham is that and more. I wouldn’t love it any other way. Auburn Gresham resident Karen Ford is a freelance writer and Treasurer of the Chicago Chapter of the National Writers Union. Her recent book Thoughts of a Fried Chicken Watermelon Woman featured essays and commentary on various topics from the social to the political, including the importance of amplifying black female voices. Upon entering the Dr. Martin Luther King Jr. Park & Family Entertainment Center, I immediately wished I were seven years old and planning my next birthday party. All the components were there: a roller skating rink lit purple, a spacious bowling alley, a concession stand hawking pizza and ICEEs, and arcade games coughing up tickets that kids could redeem for prizes like whoopee cushions. The center seems aware of its appeal—a sign above the tables on the skating side reads “Home of the World’s Greatest Birthday Parties.” Thirteen parties on the skating side were in progress on the Saturday afternoon I toured, translating to a hectic room packed with energetic visitors weaving through tables and arcade games on skates. On the rink, a mix of competent adults and little kids clutching rolling bars for support cruised around to catchy songs ranging from “Uptown Funk” to “Jump on It.” By contrast, the sparsely populated bowling side felt quieter and more adult. The Center, a collaboration with the Park District, also hosts public skate and bowl times for all ages, including an adult skate on Tuesday nights, as well as skate lessons and birthday party packages for teens and adults who don’t want to miss out. Hundredth birthday party? Motorcycle party? Party bus? Wedding, fundraiser, reception? There’s a good chance that Mr. G’s can host it, and has proven so several times over. And there’s a good chance that residents of the mid- and far-South Sides know it. Located at the busy corner of 87th and Ashland, Mr. G’s, open since 1990, is simple from the outside—long, windowless, and beige. When asked why customers keep coming back, Geron Linton, manager of Mr. G’s and son of its owner, says simply: “Good business: Good service. Good food. Good facilities.” Indeed, in contrast to its exterior, Mr. G’s interior veritably simmers with light and linens. An electric guitarist warms up across the hall. “And great music,” Geron adds. The younger Linton looks like he is in his twenties and speaks softly. But for the last fifteen years, he has been immersed in all it takes to keep up that good work. He started in custodial, and today has risen to general manager. 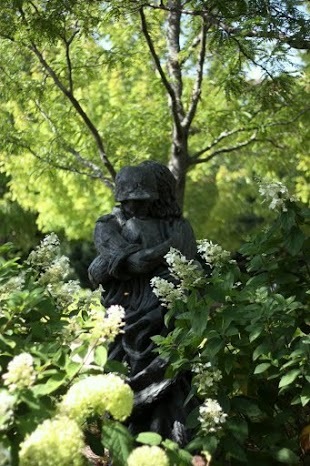 Developed by the Chicago Archdiocese of Catholic Charities in 2005, the small, sheltered grounds of St. Leo Campus for Veterans consists of a residence for homeless veterans, apartment housing for persons with physical disabilities, an Auburn Gresham community-based outpatient clinic and resource center, and, of course, a veterans memorial garden. Pass through the large stone gates to find a square half-acre of lush tranquility: well-manicured cedar, blue spruce, and pine trees bear dedicatory plaques to those who died in service. Represented and remembered are folks from all five branches of the armed forces, as well as former CPD officers and an astronaut from the Challenger spacecraft. If you find yourself on 80th and Halsted and you’re itching for a quiet place to read or think, look no further than the garden at St. Leo. As you round the corner on 87th on a Saturday night, you can’t miss the hustle and bustle that is Reese’s Lounge. The blues and pinks of the venue, the smooth tunes sashaying with every swing of the door, and the locals gathering outside to go in with their nearest and dearest all promise a good time. And they’re not wrong—Reese’s is an Auburn Gresham mainstay not to miss, whether it’s for a casual (very decently priced) Friday afternoon drink, tasty fried chicken wings that attract visitors in their own right, or for a classy night on the town. Leave the younger folks home, though—this trendy spot is 25+ only, to preserve the more sophisticated atmosphere that Reese’s is known for. Sitting in an imposing building in Auburn Gresham (somewhat out of place above a strip of low-flung storefronts) is the home of the Nation of Islam’s newspaper, The Final Call. Though the newspaper itself is not open to the public, across the street is Respect For Life Bookstore #1, the Nation of Islam bookstore, where you will find The Final Call, along with innumerable books and DVDs plastered with movement leader Louis Farrakhan’s face. Flipping through The Final Call, civil rights issues, past and present, dominate the paper. If not for frequent references to the Nation of Islam and Farrakhan, it could be another (radical, Afrocentric) newspaper. Other than the quietly attentive clerk, the only sign of life comes from the TV, blaring a Farrakhan speech, with his rising and falling cadence interrupting the calm of the store. Searching for information about the neighborhood my Dad grew up in, I came upon this article & was drawn to the author’s description of the Auburn Gresham neighborhood. Reading personal accounts such as this provides a genuine look at the neighborhood that has been home to so many and reminds me of stories my Dad would often tell me. Thank you for painting a picture of the rich history & culture of one of Chicago’s neighborhoods.